I remember over a year and half ago when I started using ZOTO recharge, I though the ZOTO bonus wasn't going to last long because ZOTO gave out free 1000 Naira on each referral, bonus cash used to .buy airtime, data, pay for PHCN/NEPA bills and also DSTV/GoTV subscriptions. Zoto cash or cash bonus does not expire on like our Network providers that gives jumbo bonuses but very little amout of time to make use of the bonus. 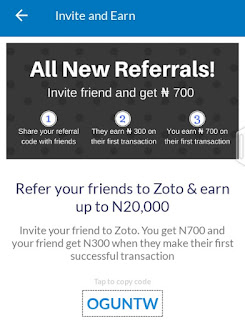 Apart from referrals, ZOTO also give free 700 Naira and 1200 Naira every week to its users. Too good to be true? you will never knw until you try it out ! Its better to look for ZOTO referrals than to look for free browsing cheat, trust me on that. 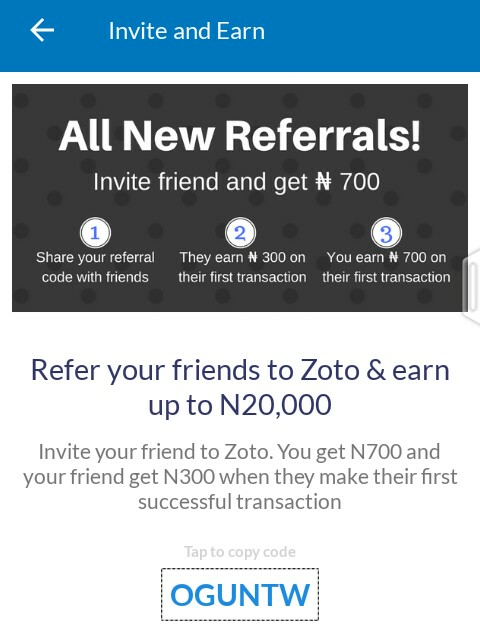 ZOTO referral program gave 500 Naira to new users who download the app and make a recharge with as little as 50 Naira but that offer ended on Monday this week. ZOTO is out with even more better offer this time, so whats the offer? When your refer a friend to ZOTO, you get free 700 Naira bonus and your friend gets free 300 Naira bonus. Remember, both you and your friend get the bonus only when that friend you refer buys at least 50 Naira airtime from the bank using the ZOTO app on his or her android device. Remember, use OGUNTW as your referral code when you register. 3. Any Network SIM, ZOTO works on all networks MTN, GLO, AIRTEL or 9MOBILE - To receive One Time Password (OTP) that will be sent to the phone number registered with your bank. This is required to authorise your bank to release the amount you requested via the ZOTO app. If you buy 50 Naira airtime using the ZOTO app, ZOTO will ask you to input your card details ( card number and CVV), then ZOTO will send a request to your bank to collect 50 Naira from your bank account balance, Your bank will in turn send a confirmation code (OTP) to the phone number registered with your account.When you supply that code to the ZOTO app, the 50 Naira will be deducted from your account. Note: The phone number you use for your ZOTO registration doesnt need to be the number you registered with your bank account, you only need that number to receive OTP, you can use that same phone number or use other SIM you have ans also any network data to access the ZOTO app on your android device. As you can see, this is no scam, is ZOTO safe? yes it is, without the OTP code ZOTO cannot withdraw any unauthorised money from your account. Ive been using ZOTO for over a year and half, it has been awsome! If you have these requirements, you can proceed with these steps to register, recharge, get your 300 naira bonus when you make your firt recharge of 50 naira, then start referring people to get free 700 Naira from each referrals. Step 3. Enter you phone number in the space provided, check if your phone number provided is correct, then click OK. Wait for about 60 seconds for ZOTO to send you a comfirmation 6-digits OTP Code. Step 6. Click and check the box "i ve a referral code" and input OGUNTW as your referral and click on OK or Save at the buttom to complete your ZOTO registration. Now its time to perform your first recharge of 50 Naira to get you free 300 naira bonus. You need to do this before you can start referring others to get N700 free bonus each. Enter your CVV (3 digits or last 3 digit at the back of your ATM card). Some card may ask you to input Card PIN, this will be your 4 digit ATM pin. Step 10. click on Pay Securely N50 to proceed to the next step which is to create new ZOTO password. Just enter any 4 digit number you can easily remember, this is different from your ATM pin so you can choose any other 4 digit number, enter the numbers again to confirm you password. ZOTO pin serves as security, so that other people that has access to your mobile phone wont have access to your ZOTO account. Step 10. Your bank will send an authorization code called OTP via text message to the phone number you registered with your bank account, input this code in the space provided for OTP on the ZOTO app, then click on confirm. Thats all, N50 will be deducted from your bank account and you will be credited with free N300. Now you can start referring people to earn free N700. Enjoy! More tips on ZOTO to get free 700 naira and N1200 every 7 days by recharging with the ZOTO app, will be shared here on Nairabit. Wow. Zoto they try o buh who's there sponsor?